Several forts dotted the North Carolina coast during the Civil War but none was more important than Fort Fisher, which gained the nickname “Gibraltar of the South.” Geography determined the fortification’s key role in the war. Fort Fisher, named for Capt. Charles Fisher, a casualty of First Manassas, was built on a peninsula named Federal Point at the mouth of the Cape Fear River, eighteen miles south of Wilmington. It served as guard for the port of Wilmington, and was the most powerful seacoast fort in the South. Construction started in April 1861, and was finished in 1865 under the supervision of Col. William Lamb. When complete the fort was the biggest earthen fort of this time, extending across the peninsula. Protecting the fort and men were 44 guns and an underground bomb shelter. More than 500 African Americans, both slave and free, worked with Confederate soldiers on construction; occasionally as many as 1,000 were working, although maintaining adequate labor was difficult. Fort Fisher was the last remaining lifeline in the closing months of the Civil War. Blockade runners took advantage of the Cape Fear River to route supplies to troops inland. On December 23-24, 1864, the Union Navy bombarded the fort which soon was refreshed with 600 more men from Wilmington, increasing the number to around 2,000 men. The Union Navy attacked again on January 13, 1865. The attack lasted two days and, on January 15, Union forces on land and sea occupied the site. Wounded in the attack was Maj. Gen. W. H. C. Whiting, the engineer responsible for designing the Cape Fear defense system. The fall of Fort Fisher robbed Robert E. Lee’s army of their last connection to the outside. Col. William Lamb would spend the rest of his life to his death in 1909 attempting to have Fort Fisher preserved but to no avail. In the 1920s a marker was placed on the site, and in the 1930s efforts were made to save the fort from erosion. During World War II, a military post was built over the existing fort and, during the 1950s, as the centennial of the Civil War approached, work would begin to make Fort Fisher a North Carolina Historic Site. Today only a few of the mounds remain, since much of the fort has been eroded by the ocean. References: Chris E. Fonvielle, The Wilmington Campaign: Last Rays of Departing Hope (1997); Mark A. Moore, The Wilmington Campaign and the Battles for Fort Fisher (1999); Rod Gragg, Confederate Goliath (1991); Richard N. Current, ed., Encyclopedia of the Confederacy (1993); William S. Powell, ed., Encyclopedia of North Carolina (2006). Recommended Reading: Hurricane of Fire: The Union Assault on Fort Fisher (Hardcover). 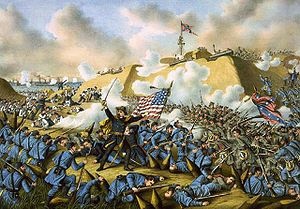 Review: In December 1864 and January 1865, Federal forces launched the greatest amphibious assault the world had yet seen on the Confederate stronghold of Fort Fisher, near Wilmington, North Carolina. This was the last seaport available to the South--all of the others had been effectively shut down by the Union's tight naval blockade. The initial attack was a disaster; Fort Fisher, built mainly out of beach sand, appeared almost impregnable against a heavy naval bombardment. When troops finally landed, they were quickly repelled. A second attempt succeeded and arguably helped deliver one of the death blows to a quickly fading Confederacy. Hurricane of Fire is a work of original scholarship, ably complementing Rod Gragg's Confederate Goliath, and the first book to take a full account of the navy's important supporting role in the assault.